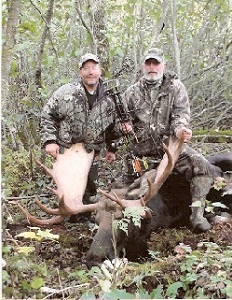 Stork Lake Lodge offers a 7 day archery moose hunt during the rut in late September. 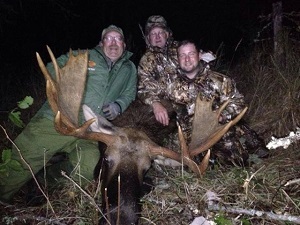 This can be a very exciting hunt with a chance of 60” bulls coming in. That is a shot you do not want to miss. Make sure your bow is in perfect operating condition and practice on your placement from an elevated stand at least 12’ in the air. You will have no problem getting your bow across the Canadian border as long as it is in the case. Your shot placement should be right behind the front shoulder just below the center line. Please practice on shooting as close as 1 yard and out to 40 yards. Our guides have brought moose in as close as 3 feet. 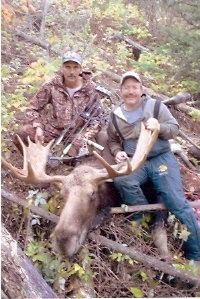 The success rate for moose hunting is high because of our large and remote hunting area. 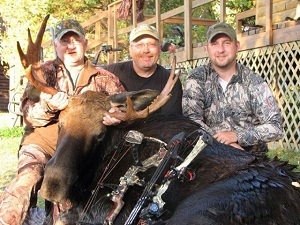 This offers quality hunts with a shot at a trophy moose. 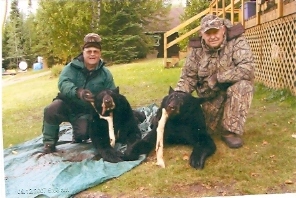 Stork Lake Lodge offers five bear hunts fully guided over bait in the fall. This is a four day package which includes three meals a day, transportation to and from the stand and a hunting guide. This can be a very exciting hunt with large boars coming in, that is a shot you do not want to miss. Make sure your bow or gun is in perfect operating condition and practice on your shot placement from an elevated stand at least 12’ in the air. Your shot placement should be right behind the front shoulder just below the center line. Please practice on shooting as close as 10 yards and out to 30 yards with a bow and out to 200 yards with a gun. 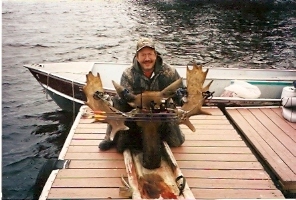 You will have no problem getting your bow across the Canadian border as long as you have it in a case. If you are bringing a gun to Canada you can go to Canadacustoms.com to get your forms to submit. Just follow the instructions. 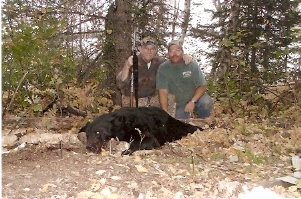 The success rate for bear hunting is high because of our large and remote hunting area. 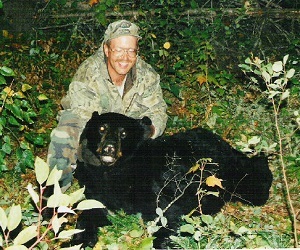 This offers quality hunts with a shot at a trophy bear. You will also have access to a boat and motor (GUIDE NOT INCLUDED) if you wish to fish at any time during your hunt. If you wish to fish during your four day hunt, you must purchase a fishing license in town before coming to the resort (see walleye fishing for details). Don’t forget your fishing pole and tackle. You must bring a copy of your home state issued hunting license or a firearms safety certificate if applicable and purchase your bear hunting license in town.